Enrique Ramírez, n°5 The international Sail, 2017. 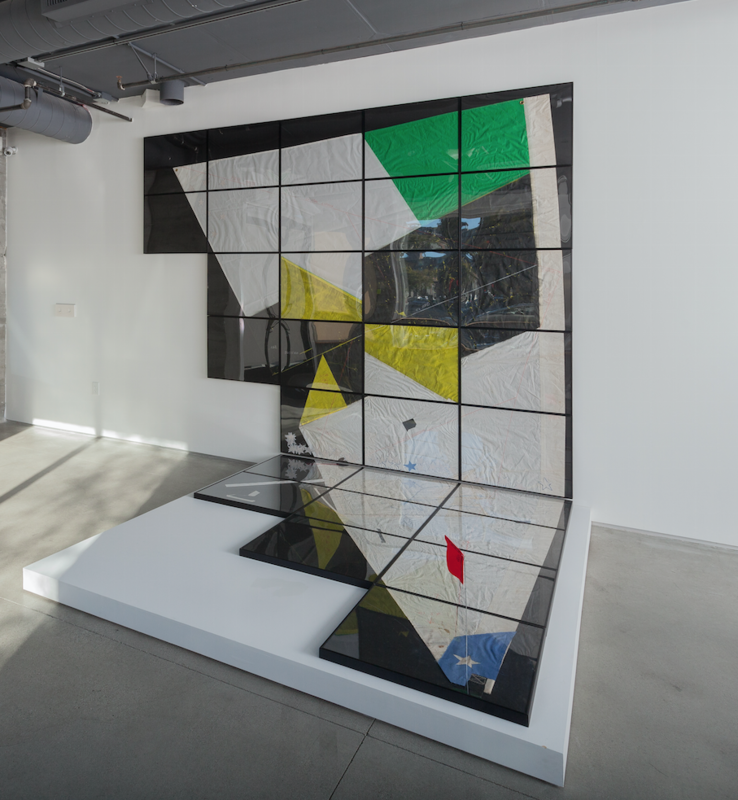 Installation view at KADIST San Francisco. Ramirez’s The International Sail is the fifth in a series that features an upside-down worn out, mended and fragmented boat sail. These works epitomize the idea of perpetual movement and migration while carrying a deep personal meaning in the creative process, as the artist’s father himself, still living in Chile, mends and sends the sails to his son, living in Europe. The reversed position of the sail recalls both the shape of South America itself and the Eurocentric view that in the Southern Hemisphere, everything is “upside-down.” The stitches themselves create an illusion of an alternative political geography, and the framed-cuts impose a cartographic grid. Enrique Ramirez produces media and photography-based work that explores the interrelationship between landscape and “subjective imaginary.” Born in Santiago, Chile, during dictator Augusto Pinochet’s violent rule, Ramirez’s highly politicized practice questions notions of exile, displacement, loss of memory and a changing sense of place. Growing up with a sail-maker father, his process often returns to the sea as a backdrop for his investigations of geo-politics. Open spaces and vast landscapes prevalent in his seductive films and installations serve as breathing room for contemplation and imagination. A sense of longing and nostalgia often haunts his works as Ramirez engages both personal recollections and gathered stories of loss and deracination. He has exhibited his work at international venues such as the Palais de Tokyo, Paris; Loop Fair, Spain; and Museo Amparo, Mexico. He received his BA in Film Studies from Instituto de Artes y Communicacion ARCOS, Chile and a Master in Contemporary Art from the Studio National des Arts Contemporains in France.